A few years ago, Samsung introduced a new feature called MultiWindow which allows you to run two applications at the same time. In my case, I had an Samsung Galaxy S6 that had it’s screen ‘bouncing’ around and displaying errors relating to running recent apps in split screen mode. Even after rebooting and wiping the cache the problem persisted . I was certain there was a disable split screen / disable multiwindow option in settings but certainly in Android 6, that is not the case. Fortunately there is a simple free app that takes care of this for you. 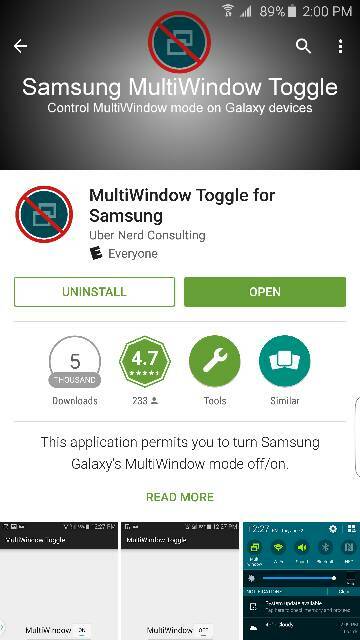 Hit the PLAY STORE and download SAMSUNG MULTIWINDOW TOGGLE. After it is installed, open it and change the only setting to OFF.